Chile restored democracy in 1990 after Augusto Pinochet, the dictator and commander in chief of the Army, lost a referendum and was forced to hold general elections. However, Pinochet remained as commander in chief and constitutional arrangements guaranteed his supporters the control of the Senate and the Supreme Court. To fulfill his campaign commitment and people’s expectation for truth and justice, newly elected president Patricio Aylwin created the Truth and Reconciliation Commission, known as the Rettig Commission. However, the prospects for justice remained dim, as both the Supreme Court and the Senate were unwilling to challenge the Amnesty Law, which Pinochet ​had earlier ​passed to shield perpetrators from prosecution for the crimes committed during the first five years of the dictatorship, when violations were massive. It took seven years after the Rettig Report was made public, until 1998, for the Supreme Court to begin to question the strict application of the amnesty law. The first decision to do so considered whether enforced disappearance was a continuous crime, still being committed until the whereabouts of the victim are identified, or if the crime concluded on the established date of death. If it ​​were ​the former, perpetrators would not be eligible for amnesty protection, as the crime continued to be committed past the period covered by the amnesty​s​. The cruelty of enforced disappearances, which leaves victims in limbo for years, decades, and even lifetimes, ultimately acted as a boomerang against its perpetrators: the Supreme Court ruled that the violation was ongoing and refused to allow them to hide behind the amnesty law. The same notion was slowly adopted by other courts, which also rejected arguments that the statute of limitations for enforced disappearances had expired. Further development on legal reasoning considered not only enforced disappearances, but also summary executions and torture, as crimes against humanity. These decisions were based on common Article 3 of the Geneva Conventions, the only convention protecting human rights at the time of most of the crimes committed. The two recent decisions follow the same trend. What is remarkable is that each court ruled on large groups of agents simultaneously, which was possible because of a written procedure that allowed for the investigation of whole operations without affecting the ability to determine the individual responsibility of each defendant. The 139 individuals found guilty in these two cases were collectively part of the process of detention, interrogation, and disappearance of the victims, and the courts treated them as such. The first of the decisions, handed down by the Supreme Court, sentenced 26 agents of the political police and 7 Army officers for their role in the enforced disappearance of 5 leftist militants in 1987 (​Supreme Court, case N° 8642-15, judgment of 21 of March, 2017​). Among the 26 agents were perpetrators at every level: the members of the operative units of the political police who carried out the initial arrests, or were responsible for custody or interrogation of detainees; intelligence Army officers working in the same operation; and the pilot of the helicopter from which victims were dropped. Even the commander of the Army Aviation who authorized the use of the helicopter was convicted. Each of them was sentenced to different numbers of years of imprisonment according to their level of involvement and of their criminal records. The Director of the political police and the School of the Americas-trained head of the Anti-Subversive Unit received the stiffest sentences. It is relevant to briefly examine how this decision justified the responsibility of so many agents. The accused alleged, among other things, that they were obeying orders. They also contested the charges, arguing that their direct participation was not proven, as they operated in a compartmentalized intelligence service in which each one of them did something (detain one of the detainees, guard the place), but weren’t aware of the overarching plan to disappear the detainees. The court also held the State liable for the illegal and harmful actions caused by its agents, and ordered it to pay a total of $7.5 million to victims. The court based its decision on international law precedents about the non-applicability of statutory limitations for crimes against humanity. It argued that if statutes of limitations are not applicable to the obligation of states to investigate and prosecute crimes against humanity, they should not be applicable either for State liability on those same crimes. Furthermore, it said that the statute of limitations did not apply because the delay in prosecution was not due to victims’ inaction, but was in fact a result of deliberate interference from the state meant to guarantee its own impunity. The Court also considered that it was the state that used all its power, resources and influence to try to guarantee impunity, which resulted on justice delayed 40 and 30 years for each case. Under those conditions, the Court thought that the state could not shield itself from liability resulting on the passage of time. The other recent decision (​Santiago Appeal Court, case Rol 2182-98, Operación Colombo episode, Victim: “Francisco Aedo y otros”, judgment of 30 of May, 2017​), sentenced 106 agents for the enforced disappearance of 16 persons between 1974 and 1975. The judgment is a first instance decision, ​which is likely to​ be ​challenged ​o​n appeal​ by those convicted​. The investigation sheds light about a wide number of victims, as those 16 disappearances the case officially concerned were part of a list of 119 victims arrested between July 1974 and January 1975, who appeared on two fake publications as having killed themselves in internal infighting among leftist groups. The 16 victims in the case are the ones who have been clearly established to have been arrested by agents or seen in detention centers run by the Metropolitan Intelligence Brigade of the Political Police. As the decision involved many accused, what is interesting is to examine how it established criminal responsibility of so many agents. The court had to examine the evidence for each of the accused, reviewing individually their allegations, and offering the justifications for the decisions in each case, but keeping the unity of the investigation. This explains the lengthy 714 page-decision. Since the crimes were committed before 2000, when a new criminal procedure establishing an oral and adversarial system was approved, the procedure applicable was the old inquisitorial and written one. Interestingly, the former procedure allowed trying so many defendants in a single case without affecting due process of law. The court used the notion of command responsibility for those in operational command of the agents who made the arrests or were part of the secret detention centers were the detainees were kept. The court considered that even if they were not direct perpetrators, they had control over the apparatus of the agents and detention centers. These are centers known for the systematic practice of torture, something verified by the witnesses in the case who survived their stay at those centers and who saw the victims there. The limited size of these secret detention centers, some of which were just houses adapted for that purpose, rendered defense arguments that perpetrators did not know they were working at torture centers unbelievable. 34 of the agents were sentenced as accomplices: these are low ranking agents, conscripts or soldiers, responsible for the general custody of the centers, and not part of the operational units responsible for detention and interrogation. However, their conduct was deemed to have facilitated the commission of the crimes. It is interesting to note that in both cases the decisions didn’t charge defendants with enforced disappearance. 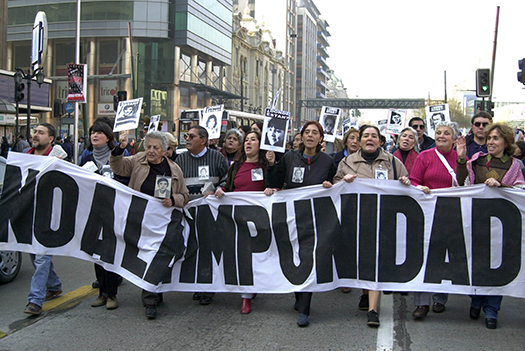 This is because, despite having Chie ratified the UN Convention for the Protection of All Persons against Enforced Disappearance in 2011, the crime of enforced disappearance has not been incorporated into Chile’s legal criminal system. However, this has not been an obstacle for courts to sentence perpetrators of this crime: defendants have instead been charged with the crime of kidnapping, avoiding discussions about the principle of legality or the retroactivity of criminal law. These are not isolated decisions. From 1998 to 2015 344 agents of the State have been sentenced for human rights violations committed during the dictatorship, of which 163 were sentenced to jail terms, not including these recent judgments. This is not a perfect picture, but shows steady progress. By the end of 2016 1184 cases of human rights violations, some of them including several victims, were open and at different stages of investigation or trial. They include dozen of cases which were closed by the application of the amnesty law which have been since reopened, based on decisions that have deemed the amnesty as incompatible with international obligations to investigate and try human rights violations. 28 special Court of Appeal Magistrates are exclusively focused on investigating these cases. This makes likely that the trend towards accountability will continue.